The cost of tickets to the AFC Divisional Playoff this weekend is skyrocketing. So, before you spend your hard earned cash for a ticket to sit out in the cold, consider some alternatives to the high-altitude sections of M&T Bank Stadium. Don’t just lounge on your couch or cram into the bars that buy the most local airtime, experience all Baltimore has to offer and join other fans who’ve watched the Ravens play at these local spots - enjoying great food, drinks, and palpable waves of team spirit. 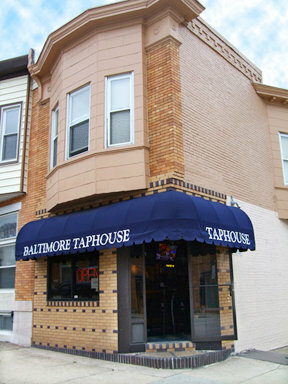 The Baltimore Taphouse, located at the corner of Fleet and Potomac Streets in Canton, is a great option for fans that are as serious about their beer as they are their hometown team. The Taphouse’s selection of 14 local and craft beers on tap is impressive for a row house-sized bar but if you don’t find something you like on tap, enjoy one of their 25 varieties of bottled brews. The spot is packed with Ravens fans on any given Sunday and while there is no food service at the Baltimore Taphouse, don’t be surprised if you see other patrons bring in crock pots of chili or boxes of Matthews Pizza (located at 3131 Eastern Avenue, just a short walk from the bar) to supplement their game day festivities. In short, The Baltimore Taphouse is a great option for an indoor tailgate where a passion for purple just might earn you a complementary shot when the Ravens score a touchdown. What’s in a name? If you’re looking for a great spot to spend your game day, it might just be a destination for your Ravens party. At Taco Fiesta, located at 618 South Exeter Street, enjoy bites of the city’s best queso and homemade chips between plays and wash them down with a couple of their “Fiesta-ritas” – they’re 2 for 1 all day. Supplementing their flat screen collection for the occasion, Taco Fiesta confirmed they are prepared for Ravens fans to mix with their already loyal Sunday brunch crowd. Get there early to get a seat along the bar and let their homemade salsas warm you from the inside out. A stone’s throw from Mother’s Purple Patio, a popular (but crowded!) game day viewing spot, is Nick’s Oyster Bar in Federal Hill’s Cross Street Market located at 1065 S. Charles Street. Whether you’re drawn to their enormous steamed shrimp, fresh sushi, 32-ounce draft beers, or many viewing surfaces, you’ll want to make game days at Nick’s a new tradition. And for those Ravens fans who’d rather not indulge in the region’s finest seafood during the game, take a walk through the market down to Big Jim’s Deli for the best overstuffed sandwiches any fan could ask for. So where do you plan to watch the game this Sunday? As great as it is to see the Ravens take the field in person, when the game starts, find yourself in a warmer spot where the drinks are served on demand and the refreshments aren’t waiting for you at the end of long line. Stake your claim to a free seat at one of these great local spots and cheer on the Ravens as they attempt to send the Texans back home to Houston.